I don't usually enjoy teaching properties because they seem so math-y. I like asking my kids to justify what they do, but for many, the properties just seem to be vocabulary that is forced upon them. Necessary evil, I guess? They are great for doing mental math tricks and kids use them without thinking of them, so I suppose there is no harm in giving a name to the stuff they already do. Raise your hand if your kids mix up associative and commutative properties? 1. Give example of property with respect to addition. 2. Ask students to write another example of their own. 3. Ask for a rule using a, b and c.
5. 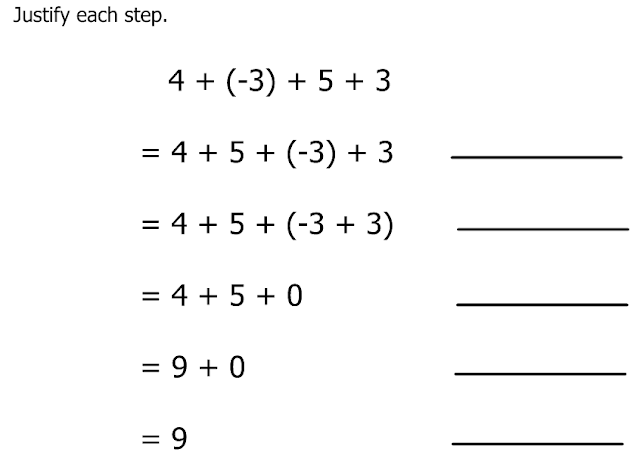 Can you guess what the property for multiplication is going to look like? 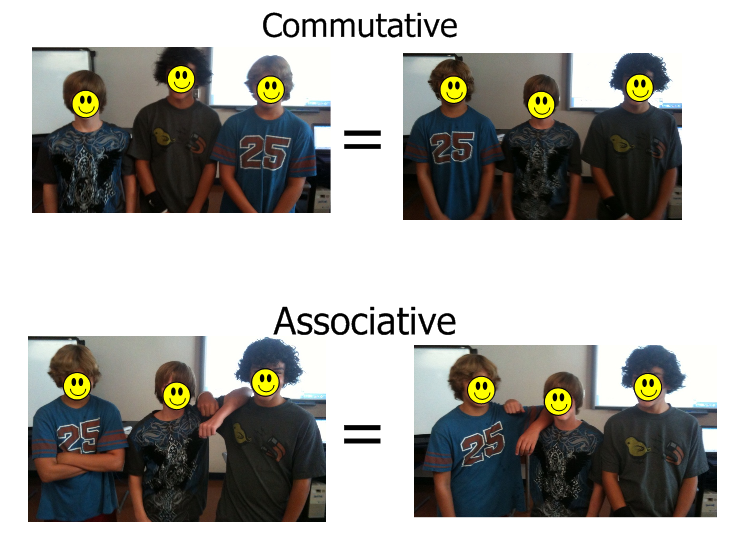 This worked great for the associative, commutative and identity properties. A great discussion on the inverse property ensued and I ended up telling them that we want a multiplication problem that equals 1. None of these properties are worth anything if we don't apply them. Next step is getting them to put words to all that stuff they "just do in my head." Let's synthesize this a bit more. 7. 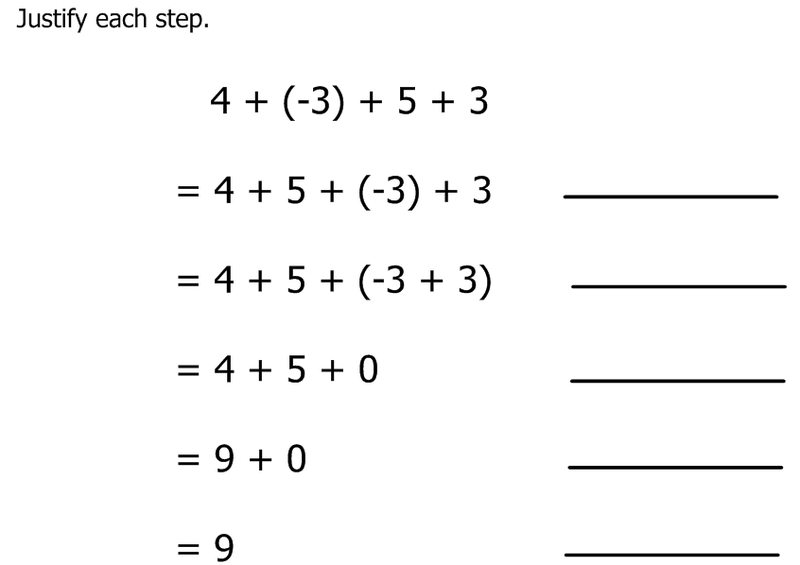 Now write a similar problem using the multiplicative properties. I told the class to keep an eye out for times when we will use the inverse and identity properties--which will happen daily once we start solving equations. I can see the value. "In your head, multiple 120 times 30." (pause) "Now, did anyone make the chart like you would on paper? How many of you did something like 12 * 3 = 36 and then add 2 zeroes? If you did it that way, you're right! But how can we justify your thought process? How could we teach a computer to do it your way?" Nice lesson to drill in conceptual understanding. I also like @CalcDave's commment about 'teach a computer' though I'm not sure students can appreciate it as much. When I taught this, I emphasised literacy skills. Some kids know the meaning of 'commute' and more know 'associate'. From here, they can guess at meanings - commute for travelling (move terms) and associate for linking or grouping. In this way, they can have an educated guess if they ever see the terms. I refer to these properties throughout the year as students prove the exponent rules, solve equations etc. I point out the relevance of the mathy rules when multiplying biggish numbers without paper. I attempt to impress on the students that without the basic axioms and properties, the math collapses. I didn't realize the purpose of the properties until after I took geometry in high school. My course was virtually all proof writing so relying on axioms and theorems was paramount to success. I actually miss the proof emphasis because I think it forces students to build simple yet solid arguments to support their work. "You wanna be a lawyer/sales person/manager of people/teacher? Learn to put together a sound argument." So I say stick with the properties...I think as kids move through the math curriculum their understanding increases and much later (college or perhaps when they begin to teach) they will remember you emphasizing the properties. No, I'm not abandoning properties. In fact, I'm using them more often this year than I ever have. I think the key is to use them as a means to an end and not as an end in and of themselves. A property is a great answer to the question "And why can we do that, again?"